File consists of photocopy of publication "Paperback: A collection of Black Australian Writings" ed. Jack Davis et al. University of Queensland Press. 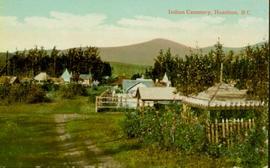 File consists of research materials consisting of printed webpages concerning Australian indigenous gardens and botany. 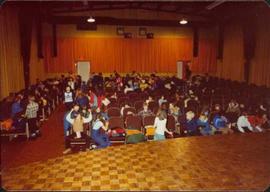 File consists of printed webpages listing archives around Australia. File consists of 3 CDs on Auckland, receipts, and handwritten notes. 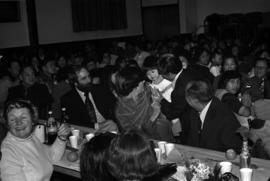 File consists of research materials gathered in Australia and related correspondence. File consists of printed webpages of research institutions, including libraries and archives, and contact information for individual researchers for Ainley's work on Australian indigenous knowledge. File consists of photocopied published research concerning aboriginal botany and women in science in Australia. File consists of research notes, drafts, and correspondence regarding research in Australia. File consists of photocopied and printed research materials on Australian Aborigines. File consists of printed webpages on the Archives of Australia sectorial network, the Canberra Ornithologists Group Contacts, and handwritten notes. 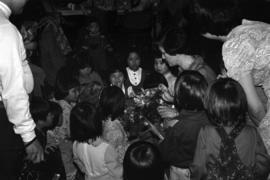 File consists of printed Australian websites including the Australian Historical Association, the National Pioneer Women's Hall of Fame, the Humanities Research Centre, and the centre fir cross-cultural research. File consists of photocopied Australian newspapers regarding agriculture and waterways. 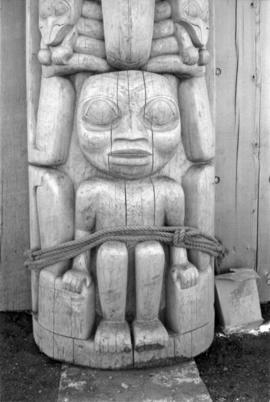 Photograph depicts a human figure at the base of a totem pole supported by ropes at Skidegate museum, Queen Charlotte Islands. File consists of printed bibliographies of research on Australian Anthropology and Australian Aboriginal Ethnobotany. 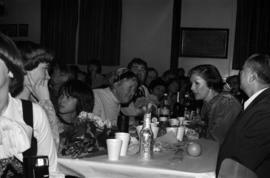 File consists of photocopied portion of a chapter on Australian aboriginal vegetables. File consists of correspondence and printed webpages on research at Central Queensland University. 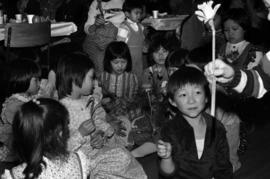 Photograph depicts a group of unidentified Chinese-Canadian children holding flowers at a Chinese New Year event at the Royal Order of the Moose lodge in Prince Rupert, British Columbia. 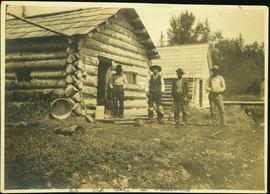 File consists of a catalogue of books on or by Australian Aborigines sold by the Cornstalk Bookshop. File consists of correspondence regarding visiting fellowship in Australia. 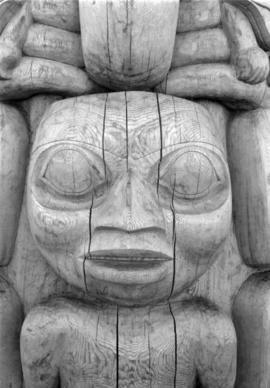 Photograph depicts a face at the base of a totem pole supported by ropes at Skidegate museum, Queen Charlotte Islands. 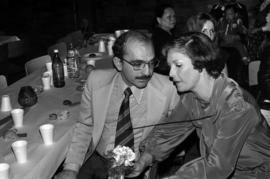 File consists of biographical information and research materials about Ronald Campbell Gunn's work in Australia. 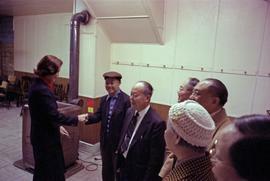 File consists of interlibrary loan request information and related correspondence. 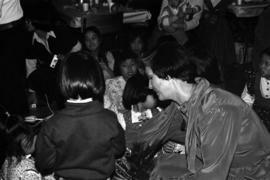 File consists of notes, questions, and correspondence for interviews and related research materials. 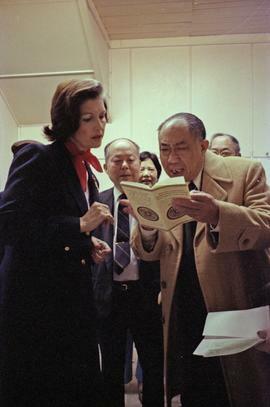 Photograph depicts Iona Campagnolo reading a chinese book with Earl Mah at the Prince Rupert Chinese Senior Citizen's Centre during Campagnolo's Skeena Riding tour. 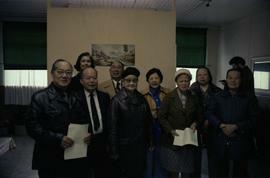 Several unidentified senior citizens stand behind them. 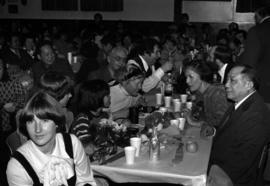 Photograph depicts Iona Campagnolo at a banquet and demonstration on the 14th anniversary of the Vancouver Tai-Chi Chuan Association. 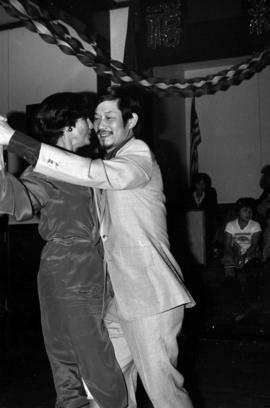 Raymond Chung, Master of the Tai-Chi Chuan Association, is cutting a large cake. 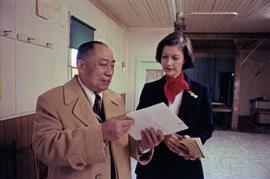 Photograph depicts Iona Campagnolo examining a document with Earl Mah at the Prince Rupert Chinese senior centre during Campagnolo's Skeena Riding tour. 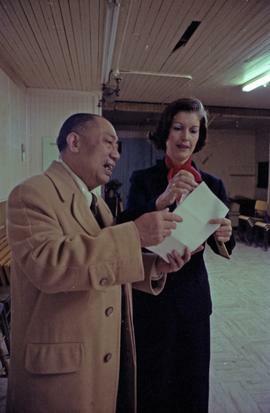 Photograph depicts Iona Campagnolo examining a document with Earl Mah at Prince Rupert's Chinese senior centre during Campagnolo's Skeena Riding tour. 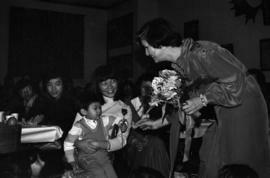 Photograph depicts Iona Campagnolo handing flowers to unidentified Chinese-Canadian children at the Loyal Order of Moose Lodge in Prince Rupert, possibly at a Chinese New Year event. 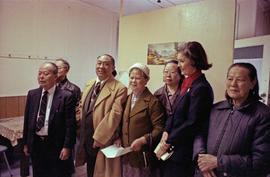 Photograph depicts Iona Campagnolo posing for a group portrait with unidentified seniors in Prince Rupert's Chinese Senior Centre during Campagnolo's Skeena Riding tour. Campagnolo and Earl Mah are at the back of the group. 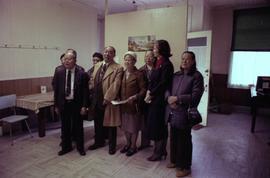 Photograph depicts Iona Campagnolo posing for a group portrait with Earl Mah and unidentified seniors in Prince Rupert's Chinese Senior Centre during Campagnolo's Skeena Riding tour. 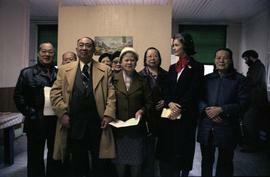 Photograph depicts Iona Campagnolo posing for a group portrait with unidentified seniors in Prince Rupert's Chinese Senior Centre during Campagnolo's Skeena Riding tour. 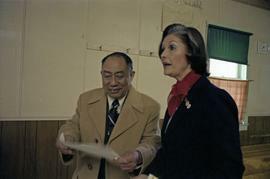 Iona Campagnolo and Earl Mah stand at the back of the group. 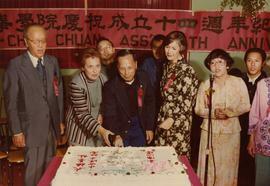 Photograph depicts Iona Campagnolo posing for a group portrait with Earl Mah and other unidentified seniors in Prince Rupert's Chinese Senior Centre during Campagnolo's Skeena Riding tour. 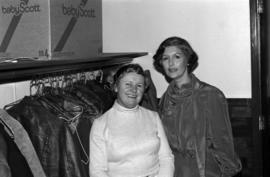 Photograph depicts Iona Campagnolo posing in a coatroom with an unidentified woman at a Chinese New Year celebration.Taken at the Royal Order of the Moose Lodge in Prince Rupert during Campagnolo's Skeena riding tour. 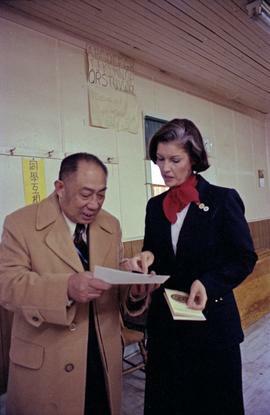 Photograph depicts Iona Campagnolo talking with Earl Mah and unidentified seniors in Prince Rupert's Chinese Senior Centre during Campagnolo's Skeena Riding tour. Campagnolo is shaking the hand of an unidentified man.